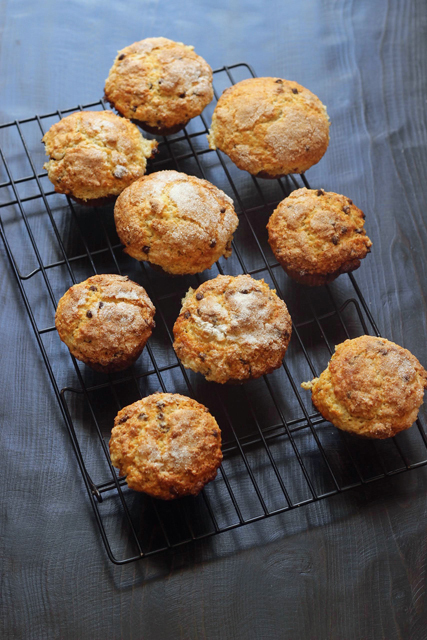 Muffins have always been a favorite breakfast or snack for me. Years ago — and I mean years — I worked in a small bakery cafe in Santa Barbara. Brigitte’s was one of the happening spots on State Street, before Starbucks took over the world. I often worked the early shift, selling muffins and making espresso drinks to the regulars. A free muffin at break was one of my special treats. Today is no different. I love to bake muffins at home, making them a big bakery style size and filling them with all kinds of goodies. These babies are filled with mini chocolate chips and apricot jam. Talk about delicious! I have a pet muffin recipe that I mix up and keep on hand for mornings when muffin mania strikes. The beauty of this Mix and Match Muffin Recipe is that you can change the fillings and mix-ins to be whatever you like. This time I stirred in chocolate chips and then spooned in apricot jam halfway through filling the cups. I sprinkled sugar over the tops before I baked them to give them a tasty, crunchy topping. Lately I’ve been baking them at a slightly higher heat than normal to give them higher tops and slightly crunchier edges. You can vary this however you like, with different chips or different jam. 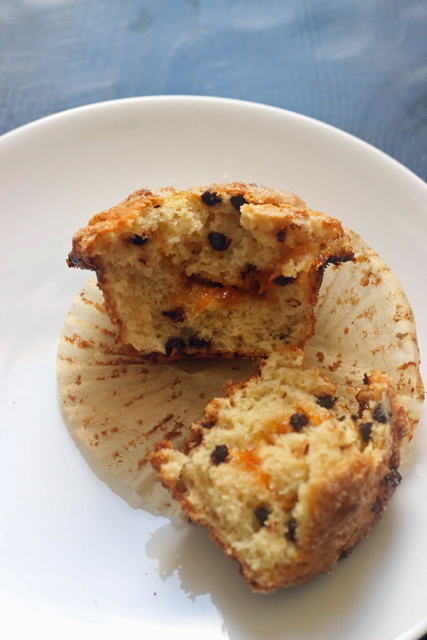 This easy muffin recipe featuring chocolate chips and your favorite jam comes together in no time making homebaking super simple. Preheat the oven to 375°. Line one 12-cup muffin tins with paper liners or spray with nonstick cooking spray. In a large mixing bowl, combine the milk, oil, yogurt, eggs, and vanilla. In another large bowl, whisk together the flour, sugar, baking powder, and salt. (Or use this homemade muffin mix!) Fold the dry ingredients into the wet. Add the chocolate chips and gently fold. Divide half the batter into the prepared cups. Spoon about 1 tablespoon jam over the batter and then top with the remaining batter. Sprinkle the tops with a generous topping of sugar. Bake until golden brown and a tester inserted comes out with a few crumbs attached, about 20 minutes. Cool on a rack. To freeze: cooled muffins can be stored in an airtight container in the freezer for up to 2 months. thinking about making these, but trying to use what I have on hand. Do you think I could use vanilla yogurt rather than plain, and just cut down on the sugar? If so, about how much sugar would you recommend? Yes. The sugar difference will be minimal. My baking stuff is typically on the less-sweet side. Apricot sounds good, but I think I would make these with raspberry! Baking cupcakes for my mom’s 60th birthday party this weekend – I think I’m going to make fewer cupcakes and make 2 dozen of these instead!! I have some fabulous strawberry jam in the fridge – going to try leaving out the choc chips and use that! Sounds great! How did it go? So, not sure why, but whenever I make these types of muffins, my jam oozes out and burns. Any thoughts? ???? I had a little jam ooze up the sides, but not a lot. I’d be tempted to just swirl all the jam in the batter and see what happens.